Instagram has grown tremendously in popularity the past year, and it has opened up a whole new avenue for buying and selling...you can find pretty much anything you want, from vintage Pyrex, to baby shoes. I've been "selling" for a few months now...and have met some great people because of it. I'm not new to selling vintage items, I have had an Etsy shop for a few years, and have also sold vintage and handmade items inside of a local boutique. I love how Instagram allows you the social interaction with the buyers...you feel like you really get a chance to know some of your buyers. The Instagram community, the vintage community in particular, is full of some pretty amazing people. I love that I've been able to meet some awesome new "friends" that enjoy the same "old" junk that I do! I love all of my "in real life" friends, but often they look at me like I'm a hoarder when I start talking about my love of thrifting and flea marketing. ha! There are also some great kid's clothing shops, and lots of crafty handmade shops. 1) It's very easy to open a shop and "set up business". 2) There are a lot of Stay/Work At Home Moms (like me), but there are people from every single walk of life...it's very diverse...and I love that! 3) Most people are honest...but as with anything there are some bad eggs that have to sour it for everyone. 4) Communication and honesty is KEY! The vast majority of Instagram shop owners are not out to scam people. Yes, there are those bad eggs that are looking to con people out of money. I think a lot of the issues with selling/buying on Instagram has to do with the fact that Instagram shops/shopping isn't regulated in any way...there aren't a set of "rules" to follow, and everyone is free to run their shop however it works for them (which is also a bonus). Often times there is a lack of communication. You are on your own as a buyer, and on your own as a seller. Especially as a seller! The only thing you have to go on, is your reputation on the internet. There is a lot of trust on the buyer's behalf when they pay you for the item you are selling. That trust is something that needs to be respected and held with the highest of responsibility...even if you're only opening shop as a "hobby"...once you open shop, you ARE owning a business...conduct yourself with the utmost responsibility of a shop owner. Setting up shop is easy...you can either use your personal account, or set up a new account specifically for your shop. If you open a new account, you'll want to mention in your profile that you also have a personal account. (I always like when I can know more about the person behind the shop). Also in your profile, it's a good idea to have a link to your blog, website, or Etsy shop if you have one, and also your email address so people can contact you if needed. It's also nice to post an "about me" photo, and introduce yourself, and let people get to know you a little bit. Take a photo of the item you're selling, and post that photo to your feed with a description of the item, how much you're asking for it, and the shipping costs. A picture is worth a thousand words, so make sure it is crisp and clear, and well lit. You can also use photo editing apps like "A Beautiful Mess", or "Rhonna Designs" (2 of my personal favorites!) to put the price and description on the photo...it does make it easier for people scrolling through your feed when you have the price on the photo. Post a "Sale Starting Now" post with your shop policies as a courtesy for your buyers. Also include the email address that your PayPal invoice will come from. Be VERY descriptive with your items...overly descriptive. Be honest if something is cracked, or has a hole, or a stain. Point it out. Take a detail photo of it. Tip 3 - Buy Buy Buy! Be a courteous buyer. Most shops are a "first email and shipping zip code" claims the item. Do NOT claim an item unless you are going to follow through with your purchase...and if you do happen to change your mind, communicate that with the seller ASAP so they can turn around and sell to another buyer. If you ask the seller a question, be aware that if your profile setting is "private", you might not get a notification that a seller has responded to your question...so you'll want to check back on the photo you asked a question. Make sure to pay your invoices promptly! Most shops have a 24/48 hour rule...so pay the invoice when your receive it in your email. Be aware that there are some scammers out there. If you're paying with PayPal (which is the ONLY payment method I'd recommend) you can dispute the transaction if you never receive your item, or if your item is not at all what the description said. Trust, but don't be naive...and if your gut is telling you something's not right, trust your judgement! As a seller, you need to be as prompt as possible. Communicate with your buyers...they are trusting you to be as up front as possible. Even if this whole Instagram shop thing is just a fun little hobby, you are still selling and accepting money, and with that comes a responsibility on your part.No, you aren't Amazon, and you don't necessarily need to offer "2 day shipping". Processing invoices and orders and staying organized and on top of it is a TON of work. And you get to do it all by yourself. Remember that little shop policy post that you posted at the start of your sale? You should state that "items from this sale will ship on (such and such date)". Over communication on this is better than no communication. I can't stress that enough! I highly recommend researching how to package and ship items, where to purchase shipping envelopes, shipping/postal scales, boxes and other shipping supplies. Etsy has a good message board that answers a lot of the shipping supply questions. Have the shipping supplies in your hand before you post your sale. There will be a learning curve with this. It can become overwhelming quite fast if you have a successful sale. Most buyers will understand if you need to extend the shipping date, but that shouldn't be assumed...you need to clarify and communicate your intentions with the buyer...and yes, this should be your number one priority. Everyone has a life outside of their job...especially when it's a hobby-job. But you are accepting money from people...you have the responsibility to ensure the item makes it to the buyer in a timely manner. If you're a buyer and had a great experience (or maybe not such a great experience...), leave a feedback photo tagging the seller...or check the seller's feed to see if they have a feedback post where customers can leave feedback. If your're a seller, show your gratefulness an appreciation to the buyer. Share your favorite shops with your newsfeed. Above all else, kindness is key. If you run in to issues with someone, don't let the veiled mask of the internet tempt you to do or say things that you wouldn't if you were face to face with the person you are having problems with. 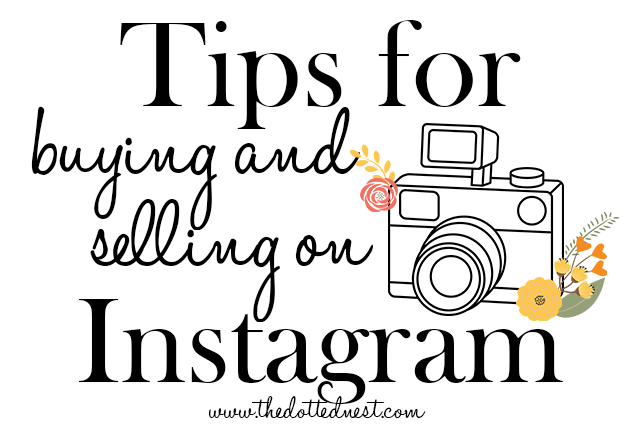 Conduct yourself with grace and integrity, and I guarantee your experiences with Instagram shopping and selling will be great!